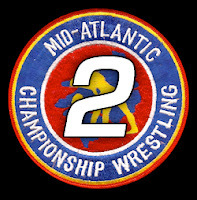 We continue our countdown of the 5 teams that competed in the Mid-Atlantic Wrestling area that never held the Mid-Atlantic tag team championships - - but should have. For our explanation of the process and our thinking behind this countdown, visit the original page here. We've selected five teams that we felt fit that mold and should have been recognized or rewarded by the booker or the promotion with the Mid-Atlantic tag team championships, but for whatever reason were never given that shot. We are going to spotlight those five teams over the next few weeks, counting down to the number one team we thought should have been given that championship - - but wasn't. DC: Booker George Scott had a tough call to make in August of 1975; who was going to replace the fabulous babyface team of Paul Jones and Wahoo McDaniel as the top challengers to World Tag Team Champions Gene and Ole Anderson? He appeared to have struck gold initially with the unlikely pairing of Tiger Conway and Steve Keirn. On September 20, 1975, Keirn and Conway upset the Anderson's in a non-title bout on the Mid-Atlantic Championship Wrestling TV show in one of the most exciting matches ever from the WRAL TV studios. However, in their subsequent two month program chasing the Anderson's, the momentum of Tiger and Steve fizzled and many of their matches with Gene and Ole were considered disappointing. But, really, what team could have followed the greatness that was the team of Paul Jones and Wahoo McDaniel? A run as Mid-Atlantic Tag Team Champions would have allowed Tiger and Steve's youth and athletic style to shine, and pitted them against other opponents where the shadow cast by Paul and Wahoo would have come into play far less. DB: This team came close to winning the NWA world tag team titles from the Anderson Brothers in 1975, and actually held a non-title victory over them on TV. As a young fan, I was convinced they would get those belts, but in hindsight they may were just a transitional challenger for the Andersons who shut down Keirn and Conway pretty quickly as we moved into 1976. A tremendous babyface combination, youthful with lots of fire and charisma. They would have made excellent Mid-Atlantic tag team champions had the titles been active at the time. This team may be the best reason those titles should not have been temporarily discontinued. Next time: Before revealing our #1, we'll take a look at several "honorable mentions" that didn't quite make our Top 5 list. 2. Steve Keirn and Tiger Conway, Jr.